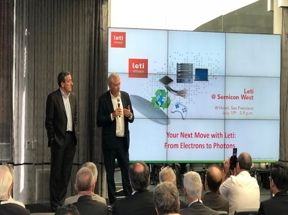 Leti, a research institute of CEA Tech, and Soitec, a world leader in designing and manufacturing innovative semiconductor materials, today announced a new collaboration and five-year partnership agreement to drive the R&D of advanced engineered substrates, including SOI and beyond. This agreement brings the traditional Leti-Soitec partnership to a whole new dimension and includes the launch of a world-class prototyping hub associating equipment partners to pioneer with new materials, The Substrate Innovation Center will feature access to shared Leti-Soitec expertise around a focused pilot line. Key benefits for partners include access to early exploratory sampling and prototyping, collaborative analysis, and early learning at the substrate level, eventually leading to streamlined product viability and roadmap planning at the system level. Whereas a typical manufacturing facility has limited flexibility to try new solutions and cannot afford to take risks with prototyping, the mission of the Substrate Innovation Center is to become the world’s preferred hub for evaluating and designing engineered substrate solutions to address the future needs of the industry, inclusive of all the key players, from compound suppliers to product designers. Using state of the art, quality-controlled clean room facilities, and the latest industry-grade equipment and materials, Leti and Soitec engineers will conduct testing and evaluation at all levels of advanced substrate R&D. “Leti and Soitec’s collaboration on SOI and differentiated materials, which extends back to Soitec’s launch in 1992, has produced innovative technologies that are vital to a wide range of consumer and industrial products and components,” said Emmanuel Sabonnadière, Leti CEO. “This new common hub at Leti’s campus marks the next step in this ongoing partnership. By jointly working with foundries, fabless, and system companies, we provide our partners with a strong edge for their future products."